Assured Response CPR & First Aid Training teaches participants to be competent First Aiders in an emergency. Learning a few simple yet effective techniques while utilizing the materials at hand will give you the necessary skills to help sustain life until EMS (Emergency Medical Services) arrive to take over. 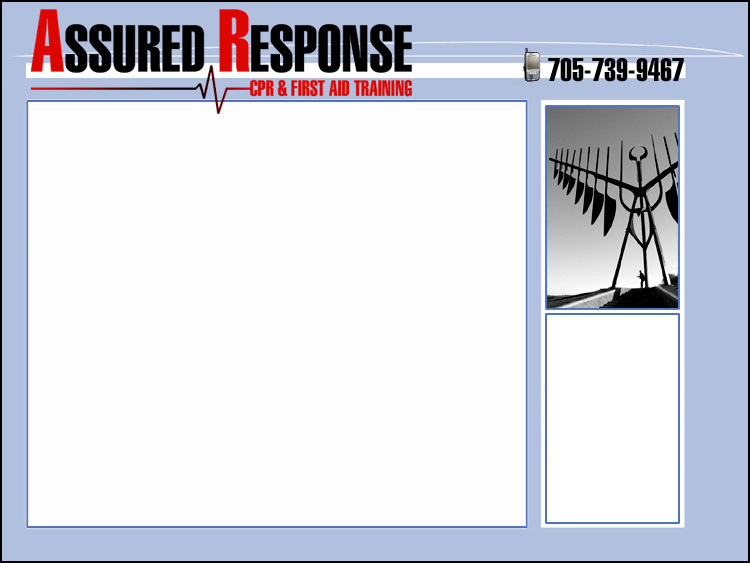 Assured Response CPR & First Aid Training programs are designed to be fun, easy and interactive. By receiving quality training that uses a combination of humour, theory and realistic scenarios requiring quick response and hands-on application, participants will leave with the knowledge, confidence and skills necessary to anticipate and avoid potential hazards and, if necessary, respond to emergencies. Centrally located in Barrie and servicing Simcoe County as well as the GTA, we provide government WSIB recognised health and safety training programs to business groups, individuals, schools and community organizations. Our key focus in the province of Ontario is the introduction and distribution of Automated External Defibrillators (AEDs) throughout schools and not-for-profit organizations, including churches, community centres, sporting facilities, etc. Assured Response wants to inform any interested businesses that they can be a key contributor in placing these critical lifesaving devices. Each employee trained in our Standard CPR & First Aid Program (as required under WSIB guidelines) will be credited towards the implementation and placement of a defibrillator to a school or organization of the company’s choice.